The Civic Centre streamlines all aspects of Brent Council's activities. Spaces are arranged around a soaring atrium. A circular drum houses event and community space. BREEAM Outstanding. Multiple awards, including RIBA National Award 2014. 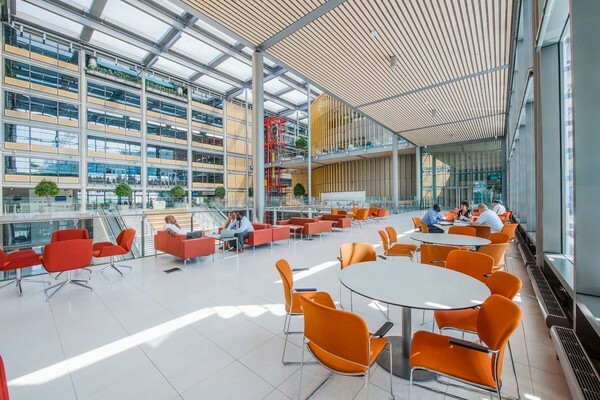 Brent Civic Centre is a large multi-use building, which accommodates a number of different functions under one roof. The building has been designed to streamline the efficient delivery of services to Brent's diverse community and is made up of the following areas. The main entrance foyer is at the heart of the civic centre. An external, covered forecourt linked to Arena Square, leads to the main entrance and the internal foyer beyond. The main entrance is set back from Engineer’s Way and displays signs announcing the front door to ensure it is clear that this is where you go on your first visit. The foyer joins the public and civic functions, predominantly in the south-east corner to the administrative offices which wrap around the north and west sides. It is designed to be open, welcoming and accessible to all, in line with all the public parts of the building. The Library attracts the highest number of visitors to the civic centre. It is located on the most prominent south-east corner and shares the ground and mezzanine floors with the Customer Services Centre. The Library is a learning resource centre, which will be a place that engenders learning and creativity; it is also be a place to meet and a host space for community events. The new wedding /civil ceremony suite is accessible from the public foyer on one side and the garden, which can be used for weddings, on the other. The garden is clearly separated from the public realm to avoid cross-over of football fans and wedding parties. It is a private space, bounded by living barriers with glimpses and long views through access gates. The open space of the garden gives clear views of the civic centre from Engineer’s Way. Ceremonial drop-off points are provided to the north of the site as well as at the main entrance on Engineer’s Way. Registration of births and deaths will be discreetly handled on the mezzanine level above. The Community Hall provides a space which can be adapted for conference, banqueting or community activity. It is a large venue which can be split up with sliding / folding partitions and joined to the Winter Garden to accommodate up to 800 seated in banquet style. Catering facilities are provided. The Winter Garden is a unique, all-year offer in Wembley. The Civic Hall is a space in which the Council can meet, performing the traditional function of the Council Chamber, yet it is flexible to accommodate different types of function with moveable furniture and adaptable IT/AV. The Board Rooms are large board type meeting rooms which are adaptable to size and requirement through sliding / folding partitions and adaptable IT/AV. Adding to the unique offer, is the access to the covered Terrace from the Board Rooms, which is open sided in contrast to the Winter Garden. Accommodation is provided for the main parties in cellular rooms with a common room for Members’ and the Mayor’s Parlour overlooking Arena Square and beyond. 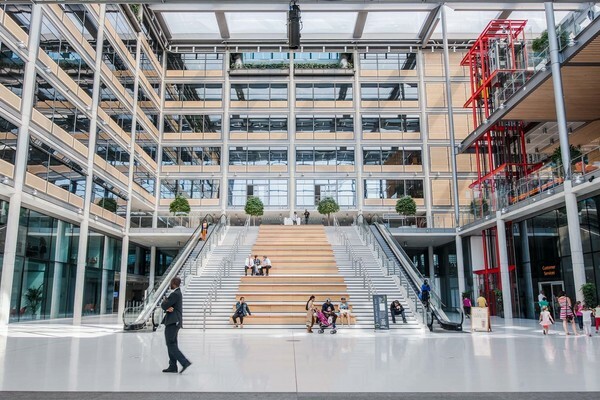 The “L” shaped administration block provides flexible open- plan office space for up to 2,000 staff, working at 80 per cent utilization at 1,600 workstations. Meeting spaces in closed rooms as well as in the office floor plate is provided in addition to quiet working rooms. Breakout areas are located close to tea points and business centres enclose support areas for office equipment. The building at the design phase was Outstanding (92.55 per cent) and on track to receive an Outstanding rating at the Post Construction Review stage. 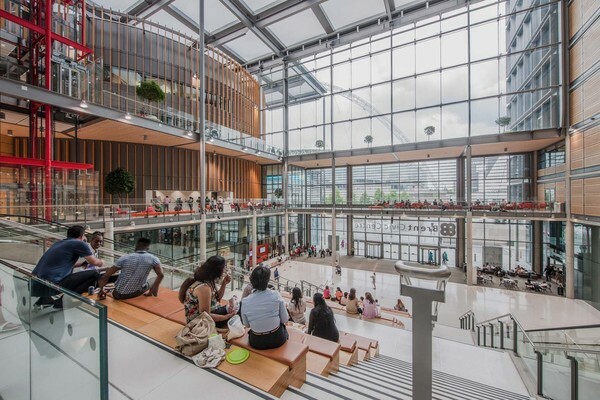 The New Brent Civic Centre is designed to be a resource efficient building using significantly less energy than a conventional building, being some 70 per cent more energy efficient than a comparable building. 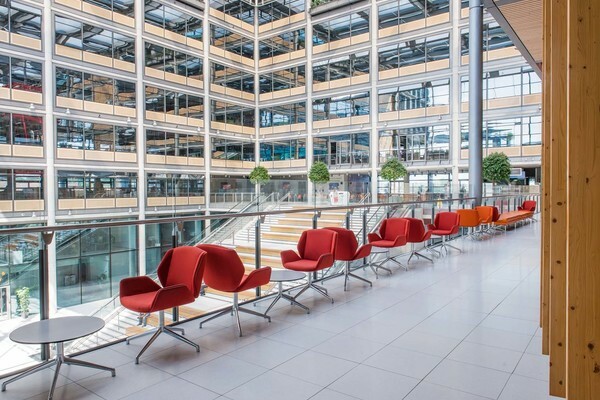 The building achieves an “A” rated Energy Performance Certificate with CO2 factor of 17 significantly exceeding the minimum factor to achieve BREEAM “Outstanding” of 25. The administration building has a green roof. Green roofing provides additional thermal insulation and extends the roof’s lifespan by protecting it from weathering and UV light. In addition roof vegetation can provide habitats for birds and insects, filter airborne pollution and reduce storm-water runoff. The site was previously a car park with no plant species. The addition of landscaped gardens, a green roof and various hanging boxes for bats and birds, and invertebrate boxes has enhanced biodiversity on the site. Specific species of bird that are being encouraged include the black redstart (Phoenicurus ochruros), which is a protected species that tends to favour urban habitats. Exterior lighting luminaries emit less than 15 per cent upward light and have a total site illuminance of 25 lux pre-curfew and 5 lux post-curfew. All external lighting is controlled by daylight sensing photocells, time switches and manual override switches. The administration building is designed to promote healthy environments for staff and visitors. All administration workstations are within 7 meters of a window, which provides natural daylight and external views at seat-level. The building is also extensively glazed to allow natural daylight to penetrate the building, and various manual and electronic sunblinds avoid solar glare and excessive solar gain. All luminaries in the administration areas have high frequency ballasts to reduce light flicker. The winter garden and public gardens offer spaces to relax. The centre itself is designed to be flexible in order to promote a long useful lifespan. The mixed-use development provides workers and the public with opportunities to work, shop and eat. 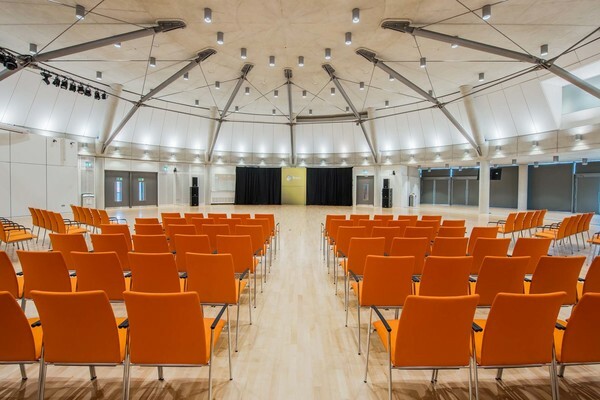 The multi-functional winter garden and community hall has the capacity for up to 1,000 people for various events, and the public garden can be used for events such as weddings and art exhibitions. 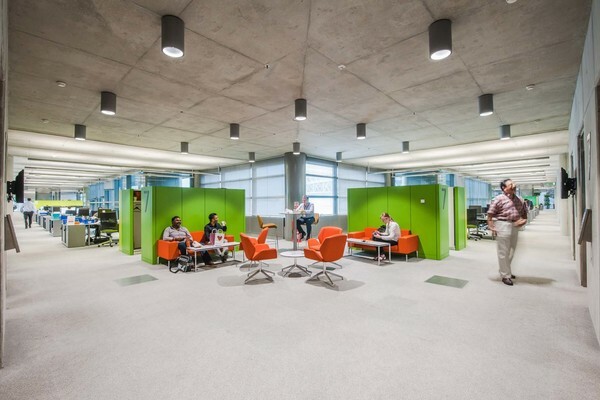 The library has enhanced learning resources and study areas. The Customer Service Centre has an interactive waiting area with self-service options. Disabled access features include disabled car parking, automatic doors, and large lifts to all floors. There are also multi-faith contemplation rooms available together with baby feeding space designed alongside baby changing facilities. The Centre has 250 cycling spaces, including 75 basement spaces reserved for staff. Showers and lockers are also provided to encourage staff to cycle to work. Bus stops are within an 8-minute walk, and London Underground lines and National Rail within a 12-minute walk. There is a dedicated travel information point in the foyer that displays public transport and taxi information and the local authority will operate a Green Travel Plan. 47 of the basement vehicle parking spaces have electric charging stations, which are connected to the waste biofuel CCHP system to provide vehicles with low-carbon electricity. The project team diverted over 90 per cent of construction waste from landfill through efficient waste management processes. Total recycled content for the project was approximately 50 per cent. Reusable packaging was used to deliver construction materials in order to reduce waste. During the commissioning phase, the project team used an innovative water treatment and reuse system to clean the chilled and heating pipe work, which reduced potable water use by 99 per cent. Water used to clean out pipework can typically amount to almost half the total water used during the construction process. 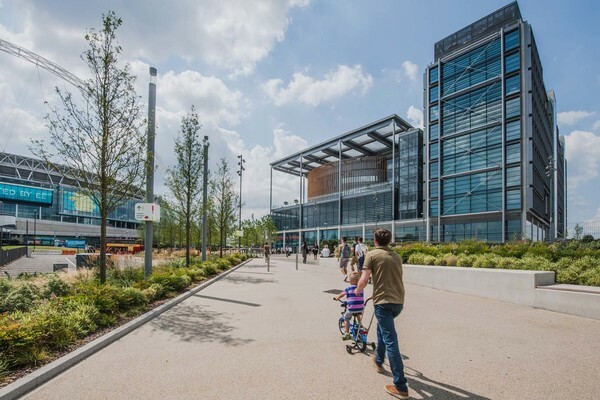 The solution similarly reduces the effluent discharge during treatment and gained an innovation credit from the BRE for its use at Brent Civic Centre. The project won the Considerate Constructors Scheme National Site Gold Award for its exceptional standards of consideration for the local community, its workforce and the wider environment from a list of 8,500 sites around the country. Regular construction updates were posted on Brent Council’s website to keep local stakeholders updated about the project. Prior to construction, local stakeholders were consulted and the project design and plans were amended accordingly to meet the concerns and issues raised.